Eggplant isn’t one of my favorite foods. I like its shine, its round, waxy purpleness. I like the sound my knife makes when it slices evenly through its flesh. And I even like its other name, aubergine, and especially the family of colors it lends its name to. But in my mind, its taste leaves much to be desired. 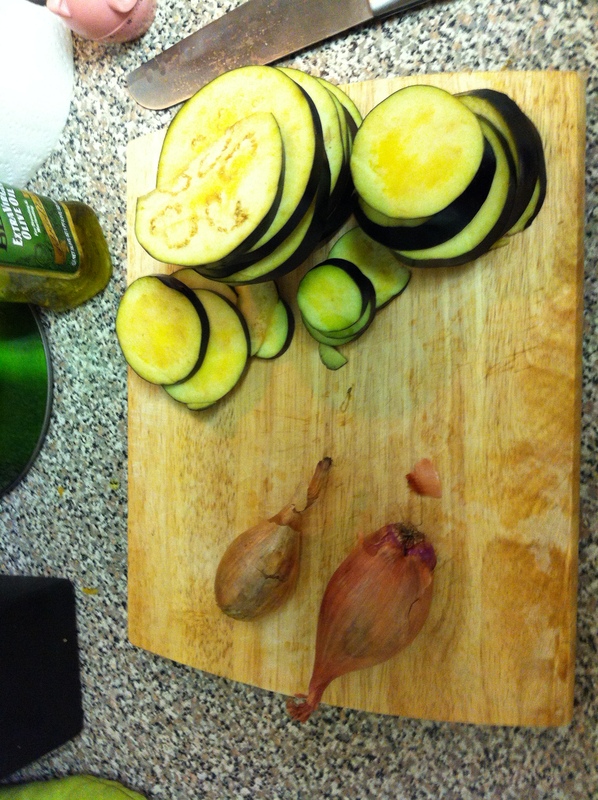 Last summer, inundated with farm share eggplants, I tried all sorts of recipes. Roast eggplant, eggplant curries, maybe eggplant in soup (a disaster that I must have blocked from my memory, because I only have sketchy details). And then somehow, somewhere I stumbled upon this recipe: Eggplant Gratin with Herbs and Creme Fraiche from Farm House Table. And my goodness. It is delicious. I made it several times last year and then forgot about the recipe until I got more eggplant in this week’s farm share. Seeing the eggplant triggered the memory, which then triggered a hasty scramble around the internet. I had modified the recipe last year, and only remembered the modified version. But eventually I refound it and then pinned it immediately, wrote a grocery list, and then darted off to the store. FH and I made this last night. And it was as good as I remembered. Like last time, I substituted shallots for chives. I also didn’t have any thyme on hand. And lastly, I don’t think that the creme reduced as much as the recipe called for. This was in part because, in the 30 seconds I turned my back from the stove, leaving FH to mind things, it boiled over. And then kept threatening to boil over. And we were really hungry. 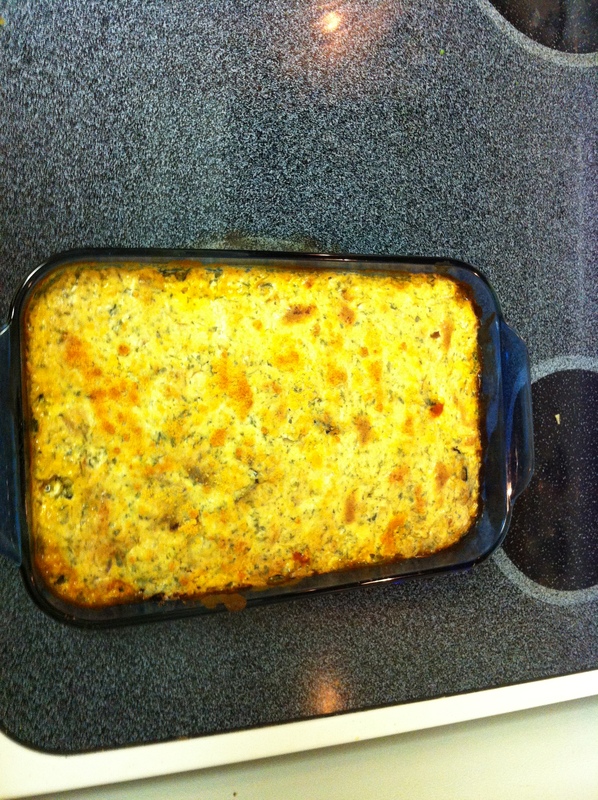 FH’s one suggestion was to add a sprinkle of bread crumbs over the top to give this dish some crunch, as it is very tasty but is also very mushy. Next time, I’ll try it! What end-of-summer foods are you enjoying? Update: I’m linking up with the What’s in the Box series at In Her Chucks. Check out some other great CSA-inspired recipes here! There’s a lot of squash in my life right now. 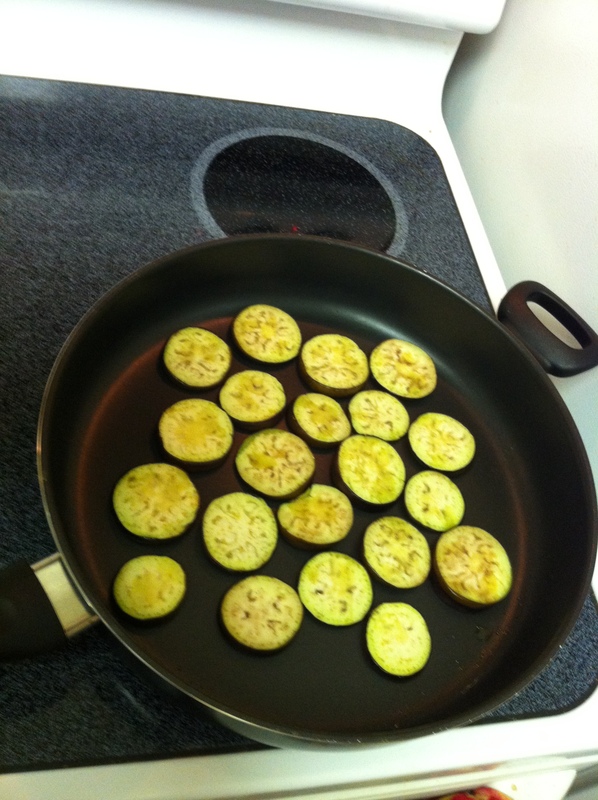 Summer squash, pattypan squash, zucchini all make their way courtesy of my friend A to my kitchen. Two weeks ago, I had a bumper carrot crop. And of course, I made carrot soup. I used this recipe from the original Moosewood cookbook, and OH my gosh I cannot stop thinking about this soup. I spiced it with raw ginger and left out the dairy and it was absolutely perfect. As in I want to eat this soup until my skin turns vaguely orange because of all the beta carotene perfect. Last week, I got tomatoes. Not a lot of tomatoes, just enough that I had a few to munch on and could make a decent pot of sauce. And I’m even writing up the recipe! When I was in grad school, my roommate Sarah was (well, is) Italian and a great cook. She taught me to make sauce from scratch. Before this, my pasta sauce recipe was to brown and drain some meat and mix it into a can of pasta sauce, which is easy and tasty but not really anything special. I sometimes still make sauce this way but when I want a little extra something, I use Sarah’s method. 2. In a big pot (in my life, the same pot I used to peel the tomatoes with the water dumped out), saute the onions and garlic in EVOO with a little bit of butter until they’re translucent and fragrant. 3. Grab a peeled tomato. CRUSH IT WITH YOUR FIST into the big pot. Be careful of flying tomato seeds. You could also slice open the tomato and remove the seeds like a normal person, but I don’t mind them and really, it’s very satisfying to crush tomatoes. Let this cook for a bit. 5. Pour some dried basil into the palm of your hand. Then add some more, until there’s a roughly a tablespoon in your palm. With your other hand, powderize the basil into the pot. Do the same with the oregano and the parsley. 6. Add some salt and pepper to taste, and some red pepper flakes. You could also add some Parmesan cheese. 7. Add a tablespoon or so of brown sugar. Taste and tweak the spices to suit your palette. 8. Cover and let simmer on low for a good long while, stirring occasionally. I let it simmer through a couple episodes of New Girl. Just don’t burn it. Makes one big pot of sauce. Eat over pasta with meatballs! And say mmmm a lot! I’m linking up here with the What’s in the Box series at In Her Chucks. Check out the links list – lots of great ideas! I went to a contra dance on Monday. I went with my man, who’d never been to a contra, but had been practicing during lonely times at work via YouTube. He was enthusiastic and caught on quite quickly. The musicians were really great and the crowd was enthusiastic, and even though the dances weren’t really beginner-friendly, he caught on really quickly. I sat out one of the dances in the second half and the band played one tune, called Glen Echo Jig, by Larry Unger (I went up and asked when the dance was over). The dance was so lovely and the tune was so happy, and I was so happy to be there. There was also a couple that had a baby in a Baby Bjorn. The baby was so calm, wasn’t fazed at all by all the spinning, and never spit out her pacifier, all while her parents were dancing away! I could see my friend Sarah being those people in another couple years. Anyway, the first jig in this video is Glen Echo, your song for the week! The video also shows what looks like a nice winter hike in the Whites. Mount Waumbek winter hike from Flamingo Hiking Productions on Vimeo. 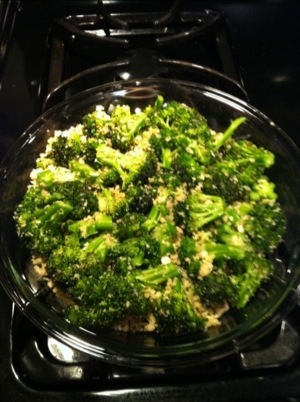 In other news, I made some roasted broccoli with this week’s farm share. I followed Alton Brown’s recipe except made one minor change: I roasted the broccoli in a glass pie plate instead of a metal cake pan. Didn’t notice any difference because quite frankly, I was too busy noshing. The toasted Panko was a brilliant addition! Look! An uninspiring photo of roasted broccoli! In addition to broccoli, this week’s share also had fava beans, a turnip and its greens, and half a summer squash. Yum! Again, I’m linking up to the What’s in the Box series by In Her Chucks. Check out the other participants here! 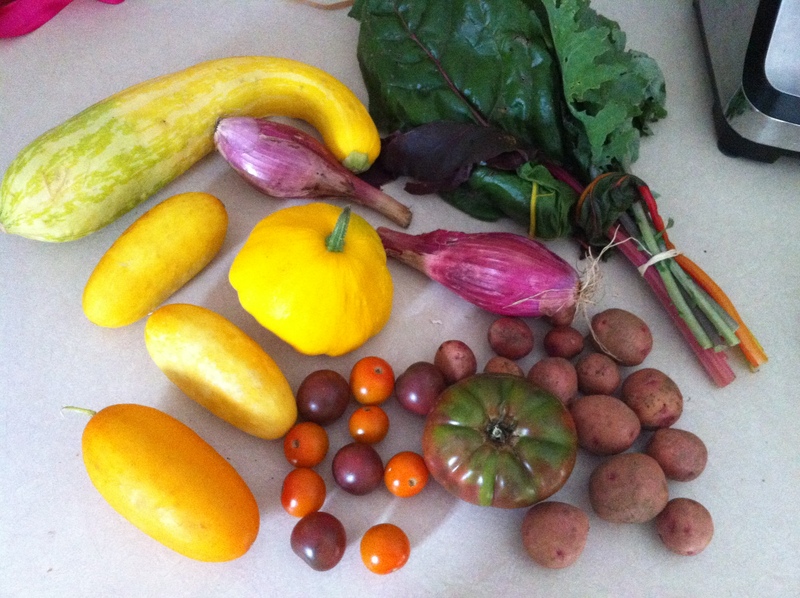 This week marked the start of my CSA’s weekly farm share! Last summer, A, B, and I split a CSA share from The Food Project. In my opinion, it was a tremendous value, perhaps because I paid one lump sum in the beginning and got bags and bags of fresh, local produce into November. We ate our way through fields of leafy greens, swiss chard, beets, zucchini, squash, and delicious heirloom tomatoes. I also froze bags of shredded zucchini and roasted tomatoes and ate them through the winter. In fact, I made my last bag of frozen tomatoes into a delicious sauce a couple weeks ago. Yesterday, I went to A’s to pick up my share. This year, there will be four of us splitting the bounty. Since there will be fewer veggies than last year, I’m hoping that I’ll be able to eat everything while it is fresh. Also, there’s a new man in my life and I’m hoping he and I will cook and eat a lot of it together. 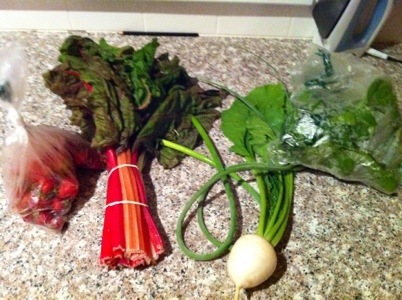 In fact, we’re going to cook some Swiss chard tonight! Also, because this year’s share is split four ways instead of three, I’m hoping to supplement the week’s veggies with visits to the Saturday morning farmer’s market in my town. Yum! 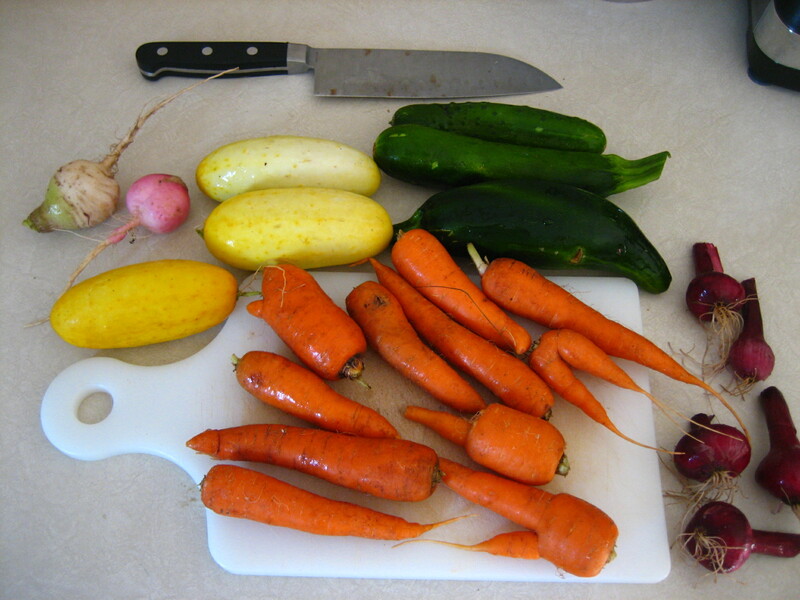 I won’t be posting pics of veggies every week, but since this was a special week, I thought I’d show off what I got. This week’s share included my beloved Swiss chard, arugula, spinach, garlic scapes, a turnip, and a bag of tiny, delicious strawberries. Stay tuned: tomorrow, I’ll post my favorite method of cooking Swiss chard!